You know I am a sucker for any of the wild and insane Shu lashes. 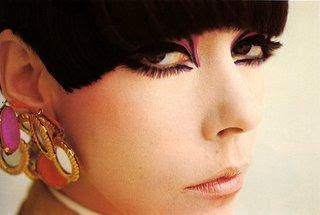 This puts me in the mind of Miss Peggy Moffitt. What is everyone's thoughts? And that means I need to post a scene from Blow Up. I had the great opportunity to work with Frances Hathaway a bit a few months ago. She is an amazing, warm hearted and incredibly brilliant woman. If any of you get a chance, look into some of her work! She can do things with makeup that an artist couldn't do on paper. Is it available on DVD? That might go on my Xmas list. Emily: She is pretty amazing! I forwarded your kind blogging on to Frances' agent and the rest of my marketing team - she said Aggy has had an incredible amount of press because of this look! Big thanks for featuring it!